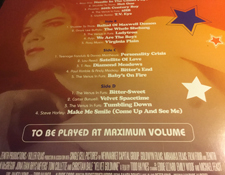 There are some really interesting things to keep in mind when considering the soundtrack to the movie Velvet Goldmine. First off, it has always resonated with me how this collection of songs stood as a bonafide "album" in its own right -- a good listening experience start to finish, with peaks and valleys, familiar and unfamiliar sounds. It is not just music that happened to appear supporting action in the movie. This sort of synergy does not happen all that often in the world of film music anymore and Velvet Goldmine is a good, fun listen. In particular, it is precisely those "unfamiliar" sounds which make this record almost an essential if you like all things glam rock, proto punk and new wave. I'll put it this way: if you like classic 1970s Roxy Music, Brian Eno, Lou Reed, T-Rex, Mott The Hoople, David Bowie, Iggy Pop (and the soundtrack / original cast recording to Hedwig & The Angry Inch, another glam homage), you proabably will want to hear this. Alternately, if you like 90s artists and bands like Radiohead, Sonic Youth, Grant Lee Buffalo, Shudder To Think, Pulp, Placebo, Mike Watt (of Minutemen fame) and The Stooges, well, you probably need this album as well. Why? Well, in addition to some classic songs by Eno, Roxy and T. Rex, you get some nifty original (then) new songs performed by the aforementioned 90s artists written in the style of the aforementioned 70s artists. These 90s artists also do some choice covers of choice 70s glam rock songs in a loving homage that is both fun and respectful of the originals. 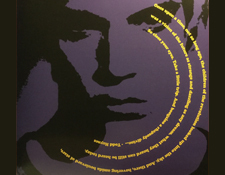 The story line is a bit involved, with the imaginary characters's lives loosely paralleling those of Bowie, Reed and Pop as well as the respective music scenes in America and England. You can read more about it at the Wiki here (especially since this isn't really a movie review, so I need to get back to the music). 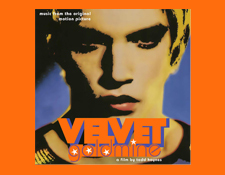 I became a fan of Velvet Goldmine -- the album -- when it came out in the late 1990s. The song "The Whole Shebang" was the first track I heard (being played in a record store, probably Amoeba or Streetlight Records) that grabbed me as a sort of alternate universe proto-Ziggy homage; writer/singer Grant Lee Buffalo delivers a performance that sounds like it could be some lost outtake from Bowie's 1971 breakthrough Hunky Dory.Other fine originals like Shudder To Think's "Ballad of Maxwell Demon" bear all the requisite Bowie-esque touches including a Mick Ronson-like signature lead guitar hook backed by big ballsy overdriven Les Paul humbucker-fueled amplifier tone. 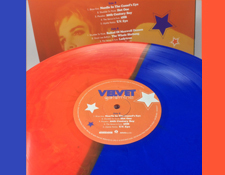 If you ever loved XTC's psychedlic 1960s alter-ego project The Dukes of Stratosphear (released in the mid-late 1980s), Velvet Goldmine could be the 70s glam rock answer to those recordings. Really, many of these songs are right up there in that league of songwriting greatness. There are other great details worth noting, such as the special one-off superstar bands formed for this album to perform some of the key songs here. "The Venus in Furs" features Radiohead's Thom Yorke and Jonny Greenwood, David Gray, Suede's Bernard Butler, and Roxy Music's Andy Mackay. "Wylde Ratttz" are The Stooges' Ron Asheton (RIP), Sonic Youth's Thurston Moore and Steve Shelley, Minutemen's Mike Watt, Gumball's Don Fleming, and Mark Arm of Mudhoney. There is a lot of authenticity oozing from these tracks -- in part likely due to REM's Michael Stipe co-production efforts. The Velvet Goldmine version of Iggy Pop's "TV Eye" smokes, in no little part due to Ron Asheton's presence on guitar. Likewise, Teenage Fanclub's take on The New York Doll's "Personality Crisis" rocks madly in all the right places. The version of Eno's "Baby's On Fire" is sort of like what might have happened had Television's Tom Verlaine and Richard Lloyd had a little guitar duel with Robert Fripp on the original, except here you have Radiohead's Johnny Greenwood and Suede's Bernard Butler filling those grand spaces quite magnificently. The choice of period original recordings on this album is pretty wonderful too! So as part of the price of admission you'll get Brian Eno's "Needle In The Camel's Eye," Roxy Music's "Virginia Plain," Lou Reed's "Satellite of Love" and T-Rex's "Diamond Meadows." This album is always only been on CD as far as I know so when the publicist for an upcoming colored vinyl special edition release contacted me I jumped at the opportunity to receive an advance copy for potential review. In general I am pretty happy with how this record sounds. Even when you turn it up loud I'm not hearing any nasty digital processing artifacts -- actually, the recordings feel pretty analog overall (but I have no real idea if it is). There is a remarkable continuity between the 70s and 90s recordings, so kudos to the mastering engineer here. The only problem I have had is a bit of surface noise which may become apparent if you have a higher end audiophile cartridge with a finer tipped stylus. I suspect it is a result of the multi-color orange/blue vinyl, but when I played this on my Music Hall MMF 7.1 turntable with its super fine tipped Goldring 2400 cartridge / stylus, there was some intermittant wooshing audible. That disppeared when I played this on my other turntable with its more forgiving Sumiko Pearl cartridge. And really, even on the Music Hall turntable, it only really became apparent on periodically-hushed tracks like my favorite, "The Whole Shebang." Otherwise the tracks are pretty loud masking anything annoying so you should be ok. Honestly, it sounds great on the Sumiko when played real loud! But.... you may also wonder how this compares to the original CD soundtrack. In short, there is no contest. "Virginia Plain" sounds tepid and thin there compared to the LP version which is fat and full of bravado. "Personality Crisis" sounds tinny and harsh on the CD relatively instead of the commanding wallop of the LP version. You can't really turn up the CD real loud either as it just sounds unpleasant, at least on a good home stereo (in the car, the CD does just fine). This new version of Velvet Goldmine is a big improvement over the old CD. There is a version of the album up on Tidal but that is a CD version (for some reason the T-rex song is not available for streaming). So, for the complete experience I guess you really need a CD or the new LP. 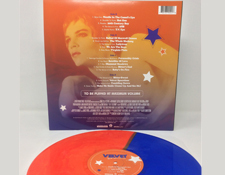 Velvet Goldmine comes out on April 5th and the orange/blue pressing is a very limited edition of 1500 copies so you might want to jump on this one sooner than later. Its a fun one!